And it was so necessary that Orange head directed the release of more JFK records? I’m sure there are more important things the fool should be directing. What’s next? Big Foot videos? Tattler's been big on Russian collusion but only with Trump. How about covering the Uranium One scandal and the fake Trump dossier. Or will that put DNC and Clinton on a negative light? Trump is the President of the United States. You'll notice we don't focus on Mitt Romney or Alf Landon, either. This isn't child care and we don't really care what the other kids did. 2) The actions of others do not absolve Trump of his strange behavior. This Story has been recycled from last year. The fact-checking organization Politifact says it is mostly true that the Clintons take from the foundation no salary, no other money, and no personal benefit. Supporters of the Clintons say that the controversy obscures valuable work done by the foundation. while others assert that the foundation made it possible for donors to gain access to Secretary Clinton, and influence her official actions. Whataboutism (also known as whataboutery) is a variant of the tu quoque logical fallacy that attempts to discredit an opponent's position by charging them with hypocrisy without directly refuting or disproving their argument,  which is particularly associated with Soviet and Russian propaganda. When criticisms were leveled at the Soviet Union, the Soviet response would be "What about..." followed by an event in the Western world. The term "whataboutery" has been used in British English since the period of The Troubles conflict in Northern Ireland. Lexicographers date the first appearance of the variant whataboutism to the 1990s, while other historians state that during the Cold War Western officials referred to the Soviet propaganda strategy by that term. The tactic saw a resurgence in post-Soviet Russia, relating to human rights violations committed by, and criticisms of, the Russian government. The technique received new attention during Russia's 2014 annexation of Crimea and military intervention in Ukraine. Usage of the tactic extended to Russian President Vladimir Putin and his spokesman, Dmitry Peskov. The Guardian deemed whataboutism, as used in Russia, "practically a national ideology". Journalist Julia Ioffe wrote that "Anyone who has ever studied the Soviet Union" was aware of the technique, citing the Soviet rejoinder to criticism, And you are lynching Negroes, as a "classic" example of the tactic. Writing for Bloomberg News, Leonid Bershidsky called whataboutism a "Russian tradition", while The New Yorker described the technique as "a strategy of false moral equivalences". Jill Dougherty called whataboutism a "sacred Russian tactic", and compared it to the pot calling the kettle black. Critics of US President Donald Trump charge that he makes use of whataboutism. 6:41 - I don't think any of the services offer medals for heroically contending with bones spurs; maybe the Air Force but I wouldn't know. President Trump didn't do himself proud on Twitter Friday morning, appearing to wish congratulations to the wrong Lee Greenwood. "Happy birthday to the great @leegreenwood83. You and your beautiful song have made such a difference. MAKE AMERICA GREAT AGAIN!" he posted. However, @leegreenwood83 is not the flag-waving performer, but an account that says it belongs to a New York lawyer with the same name. Releasing the John F Kennney records is mere grandstanding. Nothing else. It certainly is not about policy or anything else that requires critical thinking from President Bone Spurs. Trump will use anything to try and distract people from his Russian collusion. Kudos! Friday dump day! Break it down. "In harms way", only if you missed out on basic training when "you" signed up for duty. 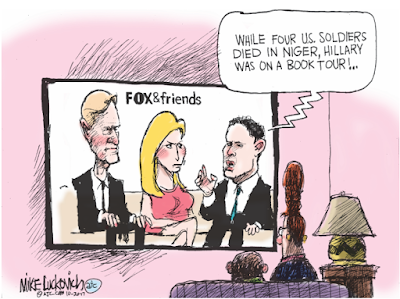 Phone call insensitive; only because it's an election year for giddy up gal Wilson (D-Fla) and she drew attention to the Sargent's death by making it all about her. Someone at MSNBC should have coached Ronnie Regan about choosing an alternative word other than "stain on the carpet"; come on, really? MSNBC is making it to easy to understand why they are hashtag; number one crazy wanna be a news organization! Congratz to the students on taking back of UC Irvine, freedom of speech lives on. Again, the publication of the Daily Beast fails to address mental health issues and instead chooses to exploit, how typical of the left leaning rag, anything to make a buck; hypocrisy at it's best. 7:40 grunted: "'In harms way', only if you missed out on basic training when 'you' signed up for duty." Obviously another lover of the military. 7:40 Your essay consists of strings of words, non sequitur to be precise, with little substance and no citation to facts. I'm afraid you're getting another F. Your advisor strongly suggests that you drop this course and take an incomplete. 7:27: Excellent post. Whataboutism should be cited each and every time Hillary is raised by Trump supporters, particularly the part showing pervasive use of whataboutism by the Soviets and Russians, a technique now favored by their colluding accomplices in the United States. Birds of a feather not only flock together, they sing the same songs. Whataboutism wont save that nasty woman from what fate awaits her; lock her up! Whataboutism wont edit from the history books what Obama will be remembered for; the first non white person to serve as President of the United States and the first President to be found guilty of using the FISA law against opponents. Don't you understand that you have just given about as perfect an example of a whatabout defense of Trump as possible? Obviously this conversation has gone way over your little puddin' head? The Tea Loons are getting all worked up over the possibility of the first Russian style political show trials in US history. The charges will be trumped up so to speak, but rule of law is not the point. Overthrowing democracy and empowering the corrupt and bloated Trump clan is. Smoking Gun: Captured Obama email clearly points to targeting the Tea Party and Conservative tax payers by the "Obama IRS". Can anyone say ABUSE OF POWER. Good on him. The Tea Party is shot through with Putinista traitors. I think 10:03 has brain spurs. The so called 'tea party & conservative tax payer' are nothing but a tweeter front for Russian Communists, the boat is loading up with punks like thee to be shipped back to 'mother russia'. Whataboutism you don't like 9:50am! 8:27am. Lol, save Sierra Madre with blinders on? Are you not reading posts from this site! Hypocrisy is one thing but having to swim in the swamp of denial is another. President Trump is a businessman, not a Politician, and yet the "puddin heads" just dont get it. Step outside your cardboard box style of remaining stuck in your personal growth of, everything is ok just the way it is. Al Capone was a businessman, too. Politicians have been saying they aren't politicians since politics were invented. 6:41 talks about a Uranium scandal. (10) how much uranium you believe left the US to Russia as a result of the deal. Please cite reliable sources for the odd numbered items. What your dog told you is acceptable as source material only for the even numbered items. 1:40pm. You may wish to check back into reality from time to time; tune into any news source for your questions. 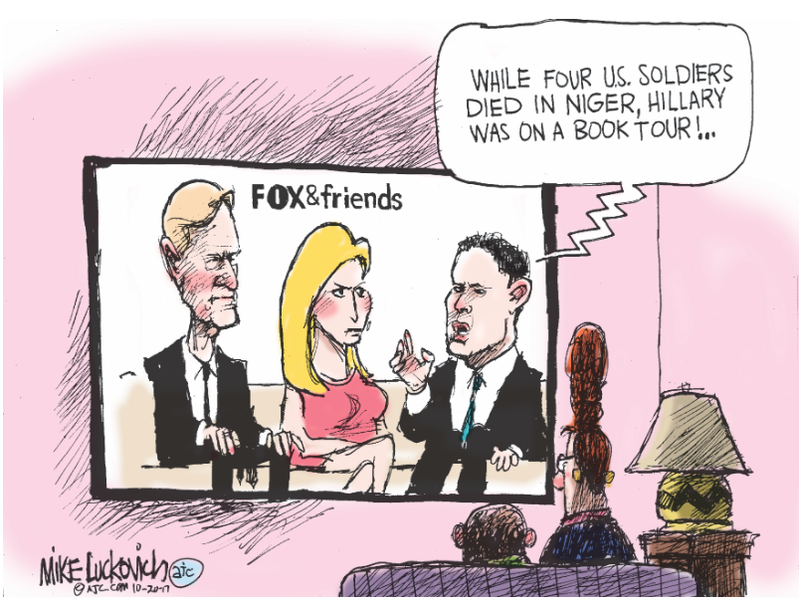 Just as long as it is Fox or Russia Today. Anything else would be fake news in the opinion of 2:36. Obama, W, Clinton, Reagan and other Presidents visited the Korean DMZ. Why won't Pr*sident Trump show his leadership abilities and go there? I see the official version is he has a skin condition called 'Yellow Streak' running down his backside. The is why is was graded 4F before and why he is a 4F seat warmer in the White House! Makes sense. He's a Red with a Yellow Streak. Everyone knows that red + yellow = orange. 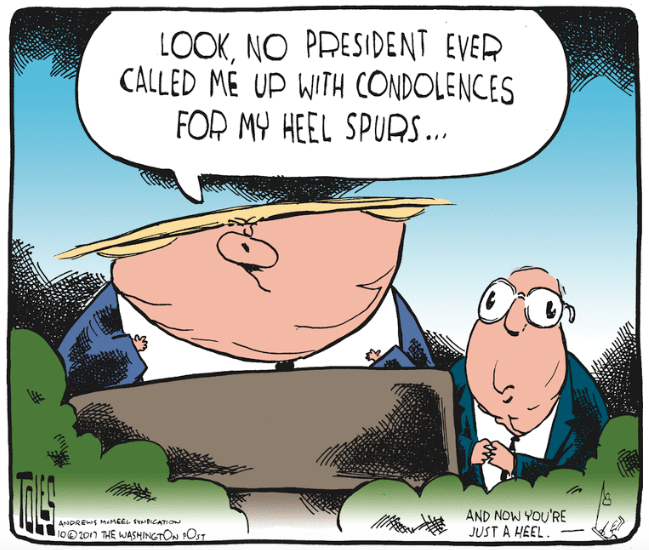 Heel spurs. And bladder control. Trump claimed an ad calling for his impeachment is "wacky," but polls show Americans have consistently wanted him removed from office after months of incompetence and corruption. Donald Trump is very upset that philanthropist and activist Tom Steyer is running an ad calling for his impeachment, but recent polling shows Americans are already onboard. 9:20 am. What? No thoughtful debate? You presented very little material to work with. You know, it just struck me. 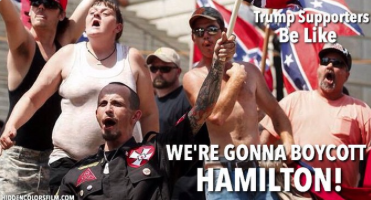 Trump's presidency is not so much a vindication of White Supremacy as it is a marketing tool to promote and validate INSANITY (and, let's face it, White Supremacy philosophy is another manifestation of insanity).